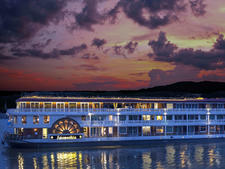 Jasmine was the first vessel introduced by the Heritage Line to sail on Halong Bay in Vietnam. A smaller ship and the pair known as "The Sisters" followed. They stand out from the crowd as they are modern-day recreations of traditional masted Vietnamese junks that combine history with high-end contemporary comforts. The names of the ships were inspired by local flowers. Jasmine has 23 cabins and a high crew-to-passenger ratio, ensuring very personal and attentive service. The cabins come in three categories. There 12 Superior cabins (two double and 10 twin) -- all located on the Main Deck -- measure 182 square feet. The have teak wood furniture and panoramic windows. Amenities include a mini-bar, slippers, robe and walk-in shower. The nine Deluxe cabins are located on the Upper Deck and measure 193 square feet, with a 21-square-foot balcony. Cabins are tastefully decorated with wooden furnishings and local artwork, and bathrooms include walk-in showers and the same amenities as the Superior staterooms. There are two Junior Suites, located on the Main Deck, with the same amenities that measure 258 square feet and have a 21-square-foot balcony. The large restaurant has enough space to accommodate all passengers at one sitting and is decorated in traditional Asian and Vietnamese style. The cuisine is a mix of international and local dishes and there is a small lounge and bar next to the restaurant. The ship has an alfresco terrace with plenty of comfy seating and it is also used for evening seafood barbecues. The Sun Deck is set out with loungers and umbrellas, and drinks and snacks are served to passengers from the bar. The massage room can accommodate two passengers and the menu includes Asian-style therapies such as a head and shoulder massage. 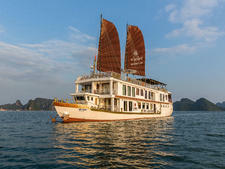 Cruises feature tai chi classes on the Dun Deck, talks and presentations on local culture, a Vietnamese cooking workshop and a bamboo rowboat trip to a fishing village. 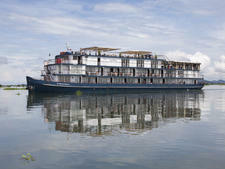 Fares include all meals, excursions with English-speaking guides, local transfers and bottled water in the cabin. 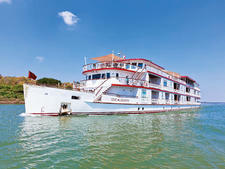 Jasmine sails two itineraries: the one-night "Dragon Passage" and two-night "Jewels of Halong Bay."